Do you plan to visit Machu Picchu and Huayna Picchu but you are not sure of the information that is on the internet? You have to know that it is necessary to book the tickets months in advance. Know the full truth about Waynapicchu Mountain and do not miss out on the most popular attraction in the Wonder of the World. Is it worth climbing the Huayna Picchu? Are Huayna Picchu tickets really hard to come by? How much do Huayna Picchu tickets cost? How long in advance should I book the admission ticket? Are the Huayna Picchu schedules accurate? How to access the discounts? Is Huayna Picchu really dangerous? Are there really stairs of death? Can I go up if I am afraid of heights? Do you need to be an expert mountaineer to climb the Huayna Picchu? Can older adults climb the Huayna Picchu? To enter the Waynapicchu mountain, you need the Machu Picchu + Huayna Picchu ticket. This entrance includes a visit to the Inca City of Machu Picchu. There is no type of exclusive ticket to enter Huayna Picchu. Because the ‘Huayna’ is located within Machu Picchu, the entrance to the Inca City is included in the ticket. For security reasons, only 400 visitors are allowed to Huayna Picchu every day. This, added to the high demand for tickets, makes getting a ticket difficult. Of course it is worth climbing the Waynapicchu mountain. In the online forums, there are many comments on this adventure. However, the vast majority of visitors agree that it is worth it. Climbing the Huayna Picchu is considered one of the most incredible short walks in the world. It is worth feeling the adrenaline of climbing its narrow Inca trails on the edge of precipices. At the top, the view is simply spectacular. During the descent, the visitor can appreciate the Temple of the Moon, the only Inca construction located in the Huayna Picchu mountain and built in the middle of a cave. The really difficult thing is finding availability of the Huayna Picchu ticket. Tickets must be booked 2 or 3 months in advance. The rest, is simply making the reservation online. The high season of tourism (from April to October) is the most difficult time to obtain the Huayna Picchu tickets. During those months, it is necessary to make the reservation 3 months or more in advance. If you do not, it is more than certain that you will not find availability. The only way to get a Huayna Picchu ticket is by booking online 2 or 3 months in advance. Otherwise, you will not find availability. Yes. The only way to get Huayna Picchu tickets is through the internet. In theory, it can also be obtained personally in the authorized offices in the city of Cusco. However, the purchase of the ticket must be 2 or 3 months before the date of the visit. Booking the Huayna Picchu ticket online has the advantage that it can be booked from anywhere in the world. Reservations are made on the official website of the Ministry of Culture of Peru or on an authorized website. There are official prices offered by the Ministry of Culture of Peru and fees with an extra commission offered by the authorized web pages. Adult (all countries) 200 S/. Student, child (all countries) 125 S/. Adult (Peru, Colombia, Ecuador, Bolivia) 112 S/. Student, child (Peru, Colombia, Ecuador, Bolivia) 80 S/. *Price in Peruvian soles (S /.). How long before booking the Huayna Picchu tickets? *The months with the highest demand are May, June and July. The departure time is at 1 pm (Group 1) and 2 pm (Group 2). Each visitor must leave on their own. The website of the Ministry of Culture of Peru only allows access to discounts for adults of the CAN. It is for this reason that many tourists make their reservation through an authorized website. These web pages offer discounts for university students and minors. The only way to get Huayna Picchu discounts for university students and minors is by booking through an authorized website. University students: Undergraduate studies and have less than 25 years at the time of the visit. The reservation is made with the current university card and passport (or identity document). Minors: To be between 8 and 17 years old at the time of the visit to Machu Picchu. The reservation is with the passport or identity document that certifies your age. The income is accompanied by his father, mother or someone authorized. Citizens of the CAN: Be a citizen or a foreign resident of Peru, Colombia, Ecuador or Bolivia. The reservation is with the passport, identity document or immigration card. If the visitor is a university student or minor, the discount is even higher. The mountain Huayna Picchu (also called Waynapicchu or ‘Montaña Joven’), is located north of Machu Picchu, at 2,720 meters above sea level. The popularity of this mountain generated a wide variety of comments and misinformation. What is the truth about this summit? Here are the main questions about this mountain and its answers. No. Huayna Picchu has narrow roads with slopes of up to 60º. Some of these trails are next to frightening ravines. Nevertheless, Danger is more an impression than a reality. The whole journey is well signposted. The most difficult stretches have safety ropes to hold on. Are there really ‘death stairs’? Yes, but do not panic. This section leads to the so-called ‘Temple of the Moon’. It is one of the most difficult and frightening parts of the road. ‘The stairs of death’ of Huayna Picchu are stone steps sculpted by the Incas more than 500 years ago. Although the place is safe (no one got injured or lost his life), the sight of the cliff produces vertigo. 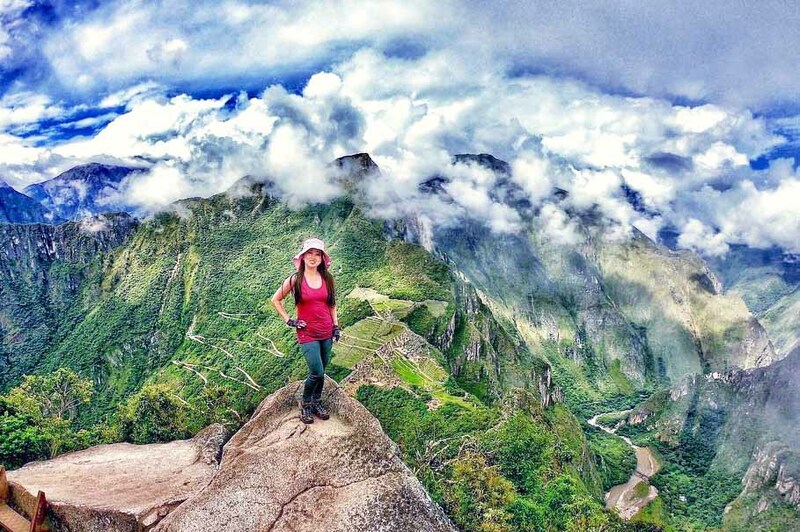 Can I ascend the Huayna Picchu if I suffer from fear of heights? It is not recommended. The only restriction to climb the Waynapicchu is to be over 12 years old. However, tourists with fear of heights should also avoid this adventure if they are not determined to overcome their fears. No. Anyone can ascend the Huayna Picchu. You do not need to be an expert mountaineer. A previous physical preparation can help although it is not determinant. Yes. The people who have made the ascent to Huayna Picchu comment that they met several older adults on the road. Of course, itis important to consult with the doctor before doing the adventure.